Fog this morning, otherwise great day! Great day on tap today! A few high clouds are possible at the coast this afternoon but other than that and a little bit of morning fog, it looks to be a beautiful fall day. This upcoming week will be a great week in terms of weather. We have sunny skies, mild temps and a storm-free forecast. Overnight we received the new model run that starts off each day. In this model run, all the models shifted eastward and formed a tighter consensus on track/intensity. Overnight, TD 11 formed in the Central Atlantic. It is forecast to do a little loop-de-loop then go out to sea. No impacts will be felt here in New England. In fact, before satellites in the 1960’s we probably wouldn’t of known it was there. Check our tropical weather resources tab under “Links” above for some sites to get even more information about this storm. I’ve highlighted TD 11 on this infrared satellite image as it is very hard to figure out where it might be (I had to double check the coordinates because I was unsure). You can clearly see a cold front sweeping across the US as well as (but not as clearly) a trough of low pressure in the Caribbean that will eventually move into the Gulf and hit the Gulf coast, possibly as a tropical entity. We’ll have to watch it very carefully as it could cause problems. 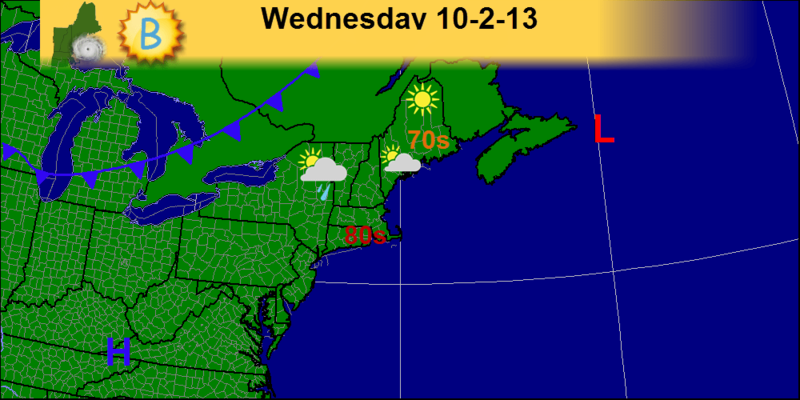 Even here in New England, the remnants could bring some decent rain. The 12z model run shows great disagreement between models as the ocean storm slated to hit Monday approaches. I’ll start by going over some of the things that are very clear. -This will not be a significant storm. 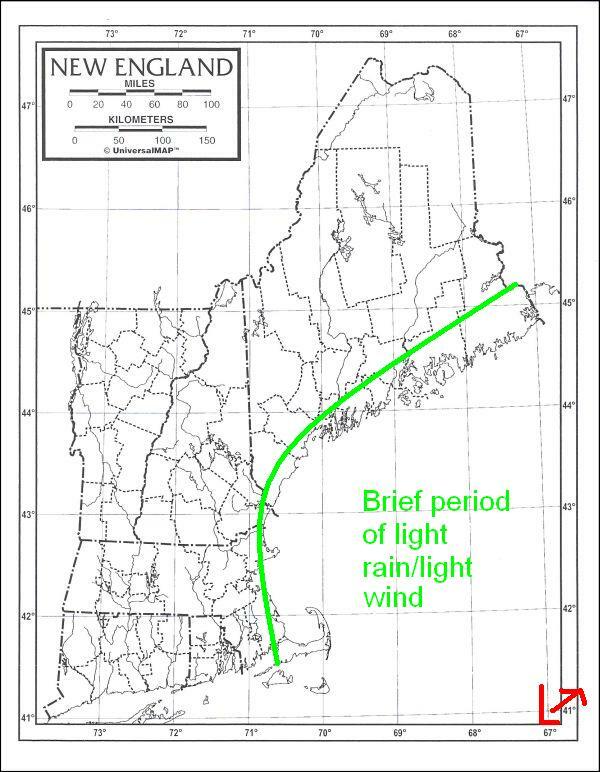 There is agreement that there will be nothing more than rainy and breezy conditions at the very worst with a much more likely scenario being that the immediate coast gets affected with a band of light rain and breezy conditions. -Timing. There is solid agreement that the rain, if any, will impact the region late Monday into early Tuesday. Not much disagreement on that front. However, the models still have no nail down 2 key aspects of the forecast. -Track. The general consensus it that the storm will come up the coast and move to the SE of the 40N 70W benchmark and then move north or north-northwest towards the Canadian Maritimes. -Intensity. The strength of the low is also very important. The NAM model has a 990mb low where the GFS has a 1008mb low. This ranges from pretty strong to pretty weak. What my forecast calls for. I think a storm of weak intensity will track just SE of the benchmark. It will then move N towards the Maritimes. I think that the only impacts will be a band of light rain affecting the coast and light winds also limited to the coast. 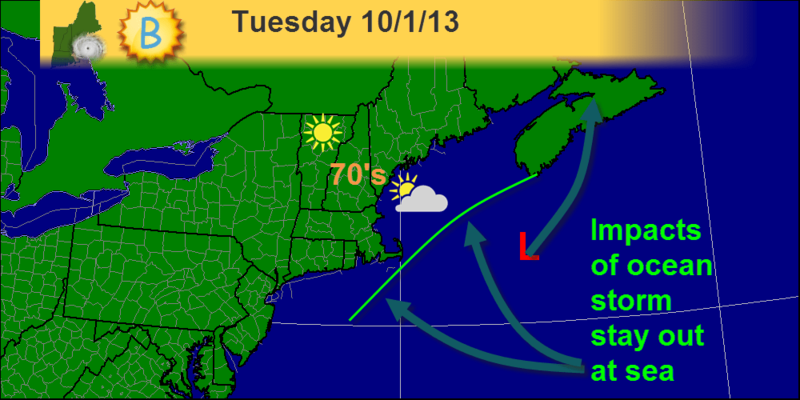 This is my forecast for the storm slated to affect coastal areas late Monday. Last night, models made no progress in agreeing with one another though one little, important feature was hinted at by nearly all of them. This little feature is a band of rain that is driven off the NW periphery of the low and forms almost its own micro-entity. This is a self sustaining band of precipitation displaced well over 500 miles from the center of the storm and feeds off the energy in the water-like a tropical storm. Another characteristic of tropical cyclones they share is that when they hit land, they dissipate. Unlike tropical cyclones however, they do not have any winds associated with them (any wind is from the low out in the ocean) and they are short-lived like a band of thunderstorms passing through on a summer day. Anyway, the NAM model is by far the most aggressive in terms of both the low development and the band of showers. The GFS brings the band in very weak and puts the low closer to shore but weaker. The euro brings the low farther out than the GFS but stronger and dissipates the band of showers before it reaches the coast. I am going with a GFS/euro hybrid by taking the euro’s idea of a stronger low a little farther offshore and combining it with the GFS’s idea that the band of showers makes it to the coast. Another example of the volatility in weather forecasting will unfold early next week. Yesterday, there was good agreement that the ocean storm that we had been monitoring was going to go out to sea. Now the models ore more divided with the Euro taking it farther to the east while the GFS brings it closer to the coast. I chose a track more on the Euro side of things but I brought in a light band of rain as the CMC suggests. The CMC track is closest to where I think it will track. The GFS brings in a band of heavy rain and puts the low in the Gulf of Maine. I do not thinks this is the right idea as the upper level trough thought to help turn the storm to the west likely will not be as strong as the GFS predicts. However, the GFS has been more or less consistent form run to run on this system so that scenario cannot be discounted. IPCC climate report- The Intergovernmental Panel on Climate Change (IPCC) which is a group of top scientists and policymakers that convene every 5-6 years and produce a 3,000+ page report on climate change. They do this over a period of about a year and the first part of the 2013-2014 report came out early this morning. One key fact it pointed out is that there is a 95% chance humans are causing climate change. Dr. Jeff Masters has a great post summarizing this stage of the report. I encourage everyone, particularly those skeptical of climate change, to look at this article. It’s very informative and sheds light on some of the potential impacts that our energy consumption has on the planet and on civilization. The first disappointment (or victory) of nor’easter season has come. The storm slated to come up the East Coast looks to be heading out to sea. All the models are on board with that solution or one like it so that is what the forecast calls for with reasonably high confidence. 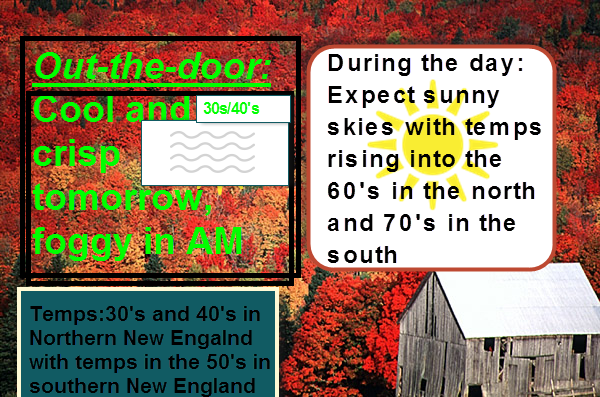 Expect a beautiful weekend with temps in the 70’s region-wide. 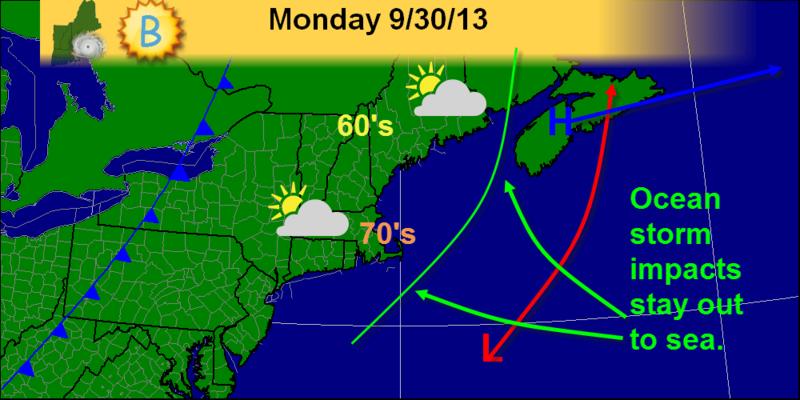 Sunny over the weekend with a few clouds Monday. Storm free for the next 7 days it looks like.